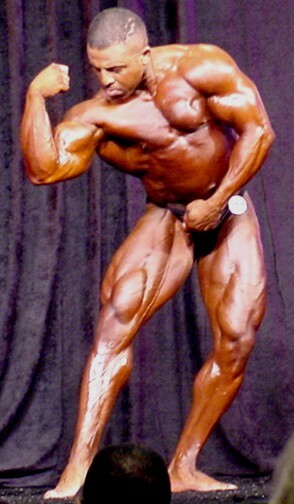 John Cutri Solid all over, with outstanding hamstrings, shoulders, back, pecs, arms, and a killer double biceps pose. Poses well, but doesn't look like he enjoys doing it. 1st place and overall over-40s winner, earning an IFBB pro card. Gus Carter A freak. Great arms, traps, legs, with a great crab pose. His upper body dominates his build. 3rd place, same as last year. Tony Jones Huge competitor with great shoulders, arms, back, like Montel with muscles. Legs cost him some. 8th place for the third time in a row here. Unranked: Kevin Baynham, Terry Parsons, Maurice Mays, Miguel Perez-Martinez, Ronald Benson. Rodney Davis He had it all: size, conditioning, huge shoulders, thick pecs, strong arms, great legs, washboard abs, tight waist. A good poser as well. 1st place and over-40s runner-up, earning a pro card (although he did the USA the following week, placing 4th in the supers).